Arizona's largest rattlesnake (up to 1,676 mm or 66" in total length excluding rattle). Coloration is gray or tan, sometimes with a pinkish, rust, or orange cast especially on the posterior portion of the body. A row of large, brown to sandy-brown, diamond-shaped blotches lines the back. The blotches have dark edges, are often outlined in cream or pale gray, and are peppered with dark speckles. The tail is marked with alternating black and white bands that are roughly equal in width. A thin, light colored stripe extends back and down from the posterior corner of the eye and touches the upper lip. The pupils are vertically elliptical and the dorsal scales are keeled. The neck is slender and the head is broad and triangular. On the end of the tail is a rattle composed of a series of loosely interlocking keratinous sections. A new section is added each time the snake sheds its skin. The steep angle of the eye-stripe, "peppered" blotches, and wide, black tail rings distinguish this snake from the similar looking Mohave Rattlesnake. This snake is distributed across all of southern and most of western Arizona. It occurs at elevations ranging from near sea level along the Colorado River to ca. 5,300' in southeastern and sub-Mogollon Rim central Arizona. It inhabits a variety of communities including Sonoran, Chihuahuan, and Mohave desertscrubs, Semidesert Grassland, and the lower reaches of Interior Chaparral and Madrean Evergreen Woodland. It seems to be most abundant above the flats on bajadas, hillsides, and slopes. The Western Diamond-backed Rattlesnake can be active at any time of the day or night when conditions are favorable. It is primarily diurnal and crepuscular in spring and fall and becomes primarily nocturnal and crepuscular during the hot summer months. It is often found coiled in the partial shade of bushes or prickly pear cactus on mild days. When a coiled snake is encountered it will often remain motionless, presumably to avoid detection. Failing that it may raise the head into a striking pose, rattle, and slowly retreat toward shelter. This snake hibernates alone or in communal dens. Like the other "pit-vipers" (members of the subfamily Crotalinae) this snake uses heat sensing pits (one on each side of the face between the eye and nostril) to detect warm-blooded predators and prey. An ambush hunter that sits coiled along rodent trails and waits for prey to wander within striking distance. It eats mice, rats, ground squirrels, rabbits, lizards, birds and occasionally amphibians. It uses venom injected through long, hollow, retractable fangs to kill and begin digesting its prey. This snake strikes, envenomates, and releases rodents. It then follows the scent trail to the nearby prey. In this way it avoids being bitten or clawed by the rodent. Birds are often held in the mouth when struck because a bird could fly away leaving no scent trail before succumbing to the venom. Mating takes place in spring and summer. A litter of up to 12 young is born in early summer. 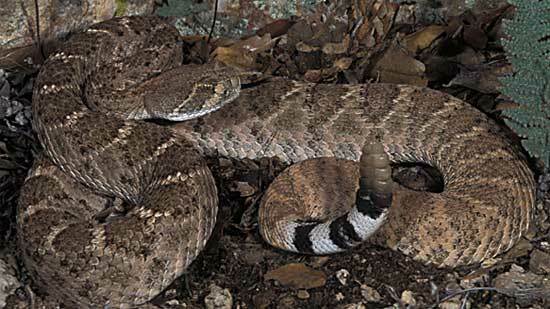 This rattlesnake is capable of delivering large amounts of potent venom. If encountered it should be left alone. A large percentage of envenomations occur when a snake is handled or abused.